Greetings and salutations! Hooray it’s officially Spring Break, we made it! I love that we are going to have some down time to relax and of course catch up on some work. Just doin the MELP thang! It looks as though i may be taking some summer classes finishing out the MELP. I am finding my particular internships are very competitive. I am going to be doing some major researching of employment opportunities over break. However, I will be happy to stay in Vermont for the summer once again. Yes, River Float here i come! Until next time.. The ground is still covered with snow and we are in the “Spring” semester. I wouldn’t have it any other way. I need to go out and enjoy the snow, before it leaves. I think I remember a little bit of my nordic ski class. Barristers Ball aka “Law Prom” was a blast, everyone looked so nice in their ball attire. That was my first formal dance, and it was definitely a night to remember. Our Native American Law Society Association (NALSA) has met in regards to activities to do this semester. It is with great deterimination to ensure NALSA is here next year. The awareness of Native American issues is important due to the many issues that impact Indian Country. Stay tuned for more news on NALSA and upcoming events. I can’t believe a year has almost gone by here at Vermont Law School (VLS). It was last year in May that I made the decision to move to Vermont. I was currently employed by a non-profit organization, who worked with twenty-seven tribes with various issues such as health, emergency management, energy and environmental. In my eight years with the organization I felt a need for a deeper understanding of my current work. I worked with Tribal Governments and the State to encourage the communication and coordination on environmental impacts between the two entities. In the past, I have worked in various environmental media positions, such as an environmental technician, specialist and tribal-state environmental liaison. I decided that I needed something more to supplement my knowledge and Vermont Law School was the answer. I have begun to explore my own environmental advocacy through persuasive writing, but also enjoying the beautiful Green Mountains while in a summer Ecology course. I am learning so much about law and policy and continue to meet my goal of a deeper understanding of the law and policy that drives the environmental movement. Stay tuned for more VLS experiences as the rest of the year moves forward to new heights and opportunities as a MELP student. Hello! I just began the MELP program here at VLS this fall and cannot believe that we’re nearing the end of the first semester already! With finals fast approaching, most of the MELPS, myself included, have been spending some quality time with the VLS library. However, the Thanksgiving holiday has been a nice little break! The MELPs staying here in South Royalton for the holiday put together a potluck Thanksgiving dinner, which was a really great time. We had turkey, mashed potatoes, cranberry sauce- the whole traditional feast. But try as we may to avoid dinner discussion about classes, we were unable to completely avoid the subject. I guess that’s inevitable when you’re a grad student and have dinner with the people in all of your classes! This actually goes to show some of the things I really like about the MELP program, though- you really get to know everyone, and because you’re in a lot of the same classes, you’re able to support each other and study together. This is especially nice for the classes we’re taking with second and third year law students. Back to Thanksgiving, though. Dinner was terrific (props to the MELP who managed to cook a turkey, I was not so ambitious and stuck to green beans), and it was great to be able to spend the holiday with friends since we weren’t able to be with our families. Oh, by the way, we just had a bit of snowfall in South Royalton this weekend! Nothing that really lasted, but it was quite beautiful as it was coming down. Hopefully any major snowfall will wait until after I make my 6-hour drive home to Maine after finals! Yep, that’s right. I’m going to post again about dam removal. I just can’t help it. There are just too many cool things happening right now not to post about it. Mostly, it’s just about the Elwha River in Washington, but there have been some great videos, an essay, and really exciting news that I want to share. First, check out these cool videos: DamNation Trailer, some on the NPS dam removal blog, and the American Rivers and Elwha Restoration Facebook pages regularly put up little video clips of explosions. Then, you can read this great essay by ex-Secretary of the Interior Bruce Babbitt. He talks about the origins of dam removal in this country. And, saving the best for last, they have already found wild steelhead above where the Elwha Dam was! Here’s one of many news articles discussing it. Simply amazing! I first wanted to post some updates about the Elwha Dam removal in Washington state. Things are happening over there, and it’s pretty cool. It’s neat to have dam removals happening on both coasts at the same time. This blog post has some cool photos to show the new sediment coming down the river. Although it looks really messy, sediment has lots of benefits for rivers — it rebuilds beaches, brings nutrients out to the ocean, and other things that scientists know more about than I do. One interesting thing, however, is that with all of the sediment that was stored in the lake behind the dam, while the river takes a few years to flush and return to normal, that extra sediment could possible suffocate salmon eggs that need oxygen. Hopefully not, but you can read more about it here. At any rate, I think scientists don’t know that much about dam removal, since it’s a relatively new thing, but I have to believe that on the whole, it’s better for ecosystems than worse. There are probably some initial negative impacts involved with all the built up sediment being released at one time, but my guess is that the river ecosystem will recover given a little bit of time. What I’m about to share may be a little strange. I know. But, it’s also super cool, so I’m going to share it anyways. Over the past month or so, several mornings we’ve woken up to find multiple (as many as 9 at one time!) luna moths on the side of our house. I’m including a photo of a luna moth for those of you who’ve never seen a luna moth before, but I can tell you from personal experience, they are pretty cool. And big. And beautiful. So, here’s the sort of strange part. I think they are coming to our house because we have a motion sensor light that stays on for awhile when it gets triggered. When we come home after dark and trigger it, the moths are attracted to it. And, I think they actually continually trigger it, which attracts even more moths. So, by the morning, we have dozens of moths (mostly small, but also some really cool ones!) all over the side of the house. I thought this was totally great. So did the robins, unfortunately. At first, I thought it was OK that the robins were picking the moths off the side of the house because they only seemed to be going for the smaller ones. But, then they got bold enough to go for one of the lime green luna moths. That’s where I drew the line. I first tried to scare off the robins, but they were persistant. Then, I tried to move the luna moths into the leafy vegetation — the birds weren’t fooled. 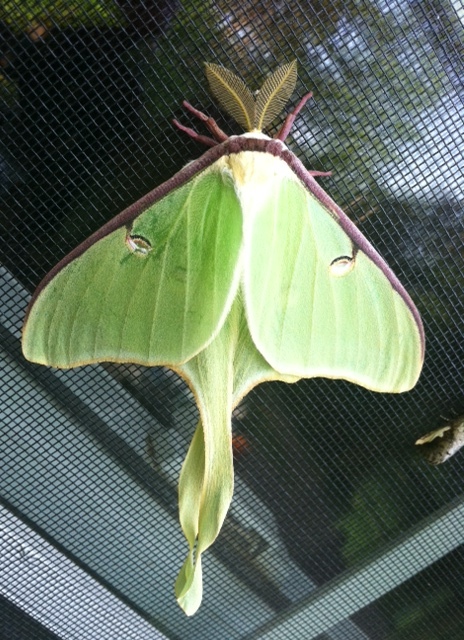 In fact, I think the jays and ovenbirds noticed the commotion and decided they liked luna moths, too. So, I had to take the only reasonable course of action, given the situation. I brought the luna moths inside the house for the day. Kind of weird I know. Some might call me a lunatic. Some might call it lunacy. But, the truth is, they just hang out all day long, usually in one place near the window, and they’re lovely to look at. Also, I don’t feel guilty about luring them to our house and certain death in the morning when we come home late and trigger our motion sensor light. So, really, I feel better, they are alive, and it’s essentially a win-win situation. Except for the robins, of course. Why can’t they eat the slugs off of my lettuce instead?! 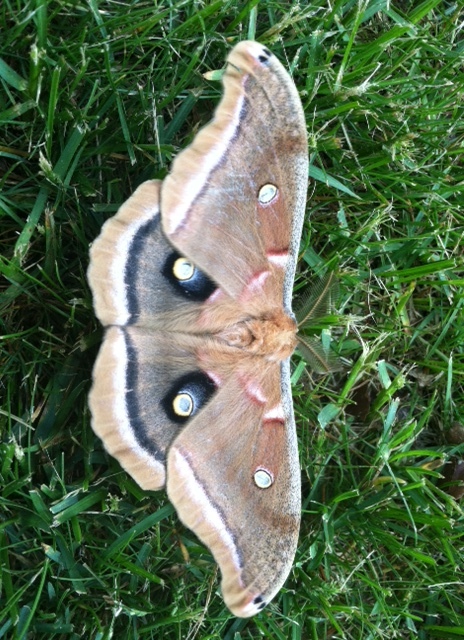 At any rate, I hope you get to see a luna moth, or a Polyphemus moth (the brown one below) when you come to Vermont. They are spectacular indeed. Dam removal begins on the Penobscot! I have to write about this momentous event — deconstruction began on one of the first of several dams to be either removed or retrofitted for fish passage on the Penobscot River in Maine. For me, this is such a cool thing because I remember first learning about the possibility for dam removal on the Penobscot when I was an undergrad. Then, I went to work for American Rivers, who was one of the NGOs in the coalition working to remove the dams on the Penobscot. At that time, they were still trying to raise enough money to buy the dams from the owners, so that they could then be removed. Then, I left American Rivers, and didn’t follow the process too closely. So, when I heard the news that dam removal would begin this week, it made me super excited. It’s especially cool since right now I’m doing some research into the passage of the Federal (Water) Power Act, which was the federal legislation meant to guide water power development in this country. One of the critical things that some people fought for was to give the public the ability to change the conditions of a hydropower license, or even decide not to renew the license at the end of its 50 year life, if the public interest warranted such action. I don’t know all the details for the Penobscot (in particular, I don’t know whether they’re licensed under FERC or not), but it’s so cool to see the public changing its mind and removing these dams, after realizing they do more harm than good. Anyways, I would say you should try to go check out the dam removal if you don’t live that far from Maine! I know that includes me — hopefully I’ll have a chance to see it. Here’s an idea for a good, ongoing study break from early spring through the summer: plant a garden! It will definitely take some work, but it will let you get dirty, sweaty, and hopefully full (assuming your seeds grow into something edible). From the little reading I’ve done so far, the closer your garden is to where you live, the easier it will be and the more likely you will tend to it. There are some community garden plants in SoRo (I’ve never actually used one, so I can’t comment on what they are like), but if you don’t have garden space where you live, they would seem like an excellent option. Still not too far away, and then you could get in a little walk on your way too and from the garden plot! I know it’s not true for everyone, but for me, digging around in the dirt is extremely soothing… I might even say grounding. There aren’t a lot of activities that consume all of my attention, but gardening — thinking about where and how to plant, getting the weeds out, the spacing and depth between seeds and rows right, and everything else that you end up doing when you garden, really entertains my thought completely, so that I can stop thinking about anything else. It’s certainly a good way to clear your mind and feel refreshed. Of course, you should also keep your expectations for your garden reasonable, so that you’re not dissapointed. We planted several things earlier in the spring, and several of them didn’t even germinate. Sadly, the radishes did amazing, while we never saw any sign of the beets, carrots and spinach we planted. Why did we even plant radishes, we asked ourselves. At least we can make something grow! Our plan is to harvest all the radishes today, try to make radish pickles out of them (I have no idea what those will taste like! ), and then replant that area with something we’re a little more excited about eating. Like chard. Or basil. Or chives. Yumm! At any rate, gardening is great. It’s a way to get outside. You actually get excited when it rains (because you don’t have to water! ), and, even if you don’t get to harvest anything (which seems highly unlikely) it’s really fun to see what all the seeds look like when you plant them. My favorite looking seeds are cilantro, bush bean, and chard. You should check ’em out!